The final step required to setup your Tethys Platform is to link it to the software that is running in the Docker containers. This is done using the Tethys Portal Admin console. 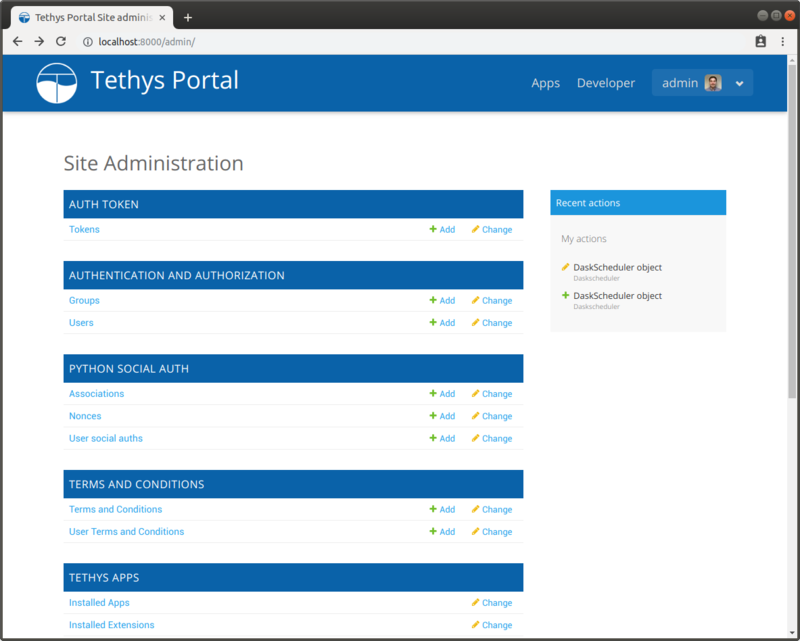 The Tethys Portal Admin Console is only accessible to users with administrator rights. When you installed Tethys Platform, you created superuser. Use these credentials to log in for the first time. When installing Tethys with the installation script the superuser credentials would have been specified with the -S or --superuser and the -P or --superuser-pass options. If you did not specify these options then the default username and password is admin and pass . Use the "Log In" link on the Tethys Portal homepage to log in as an administrator. Select "Site Admin" from the user drop down menu. 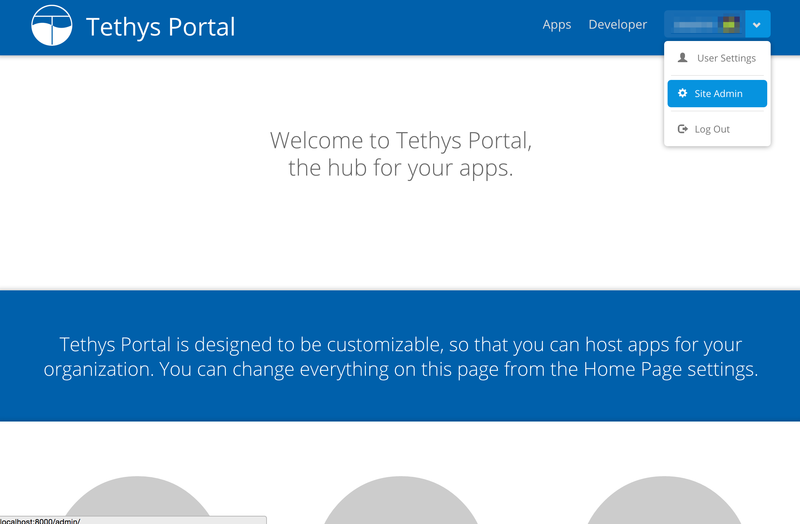 You will now see the Tethys Portal Web Admin Console. 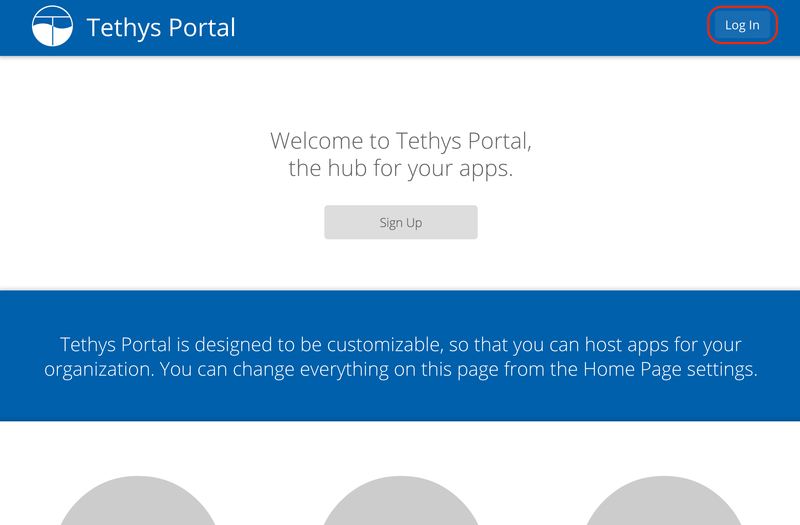 The Web Admin console can be used to manage user accounts, customize the homepage of your Tethys Portal, and configure the software included in Tethys Platform. Take a moment to familiarize yourself with the different options that are available in the Web Admin. 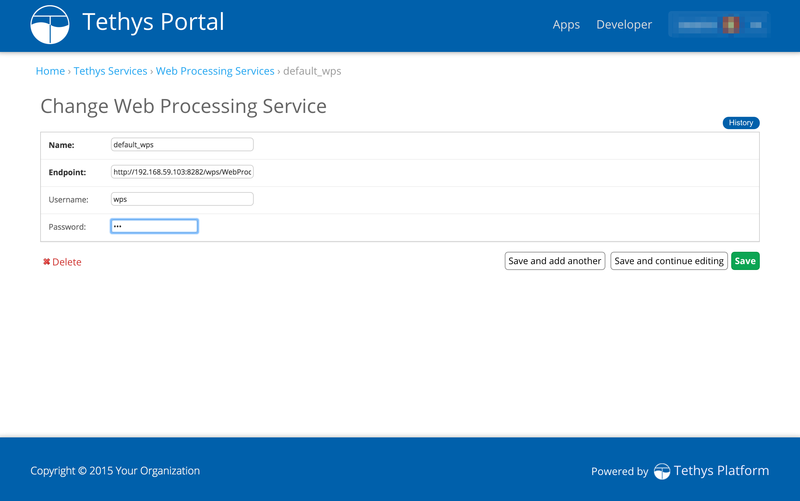 Select "Web Processing Services" from the options listed on the Tethys Portal Admin Console. 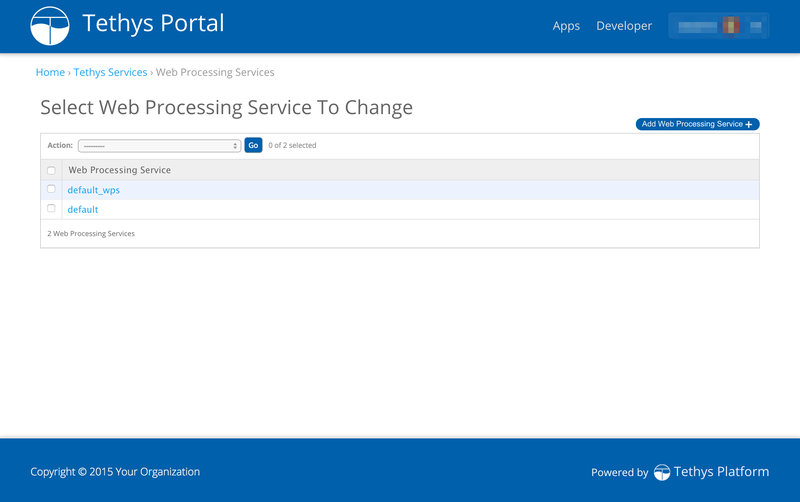 Click on the "Add Web Processing Service" button to create a new link to the web processing service. Provide a unique name for the web processing service. Press "Save" to save the WPS configuration. 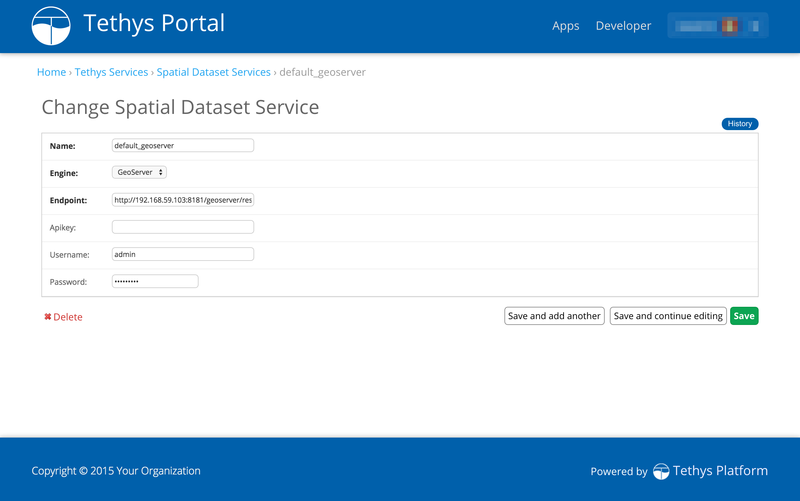 Select "Spatial Dataset Services" from the options listed on the Tethys Portal Admin Console. 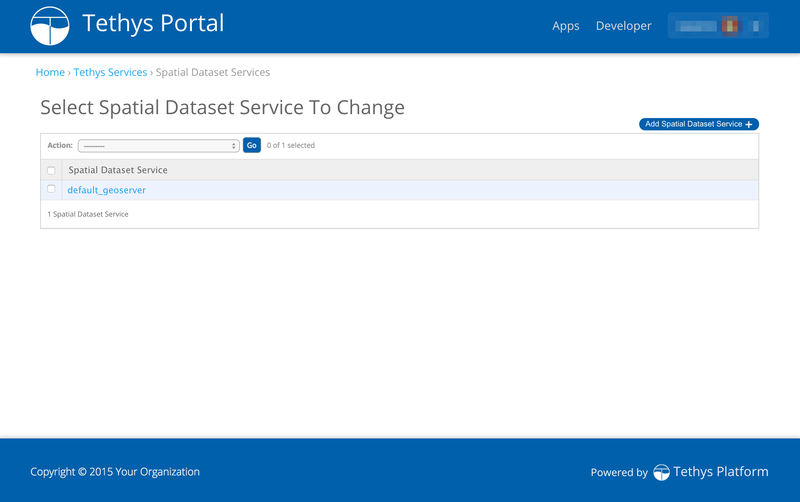 Click on the "Add Spatial Dataset Service" button to create a new spatial dataset service. Provide a unique name for the spatial dataset service. Press "Save" to save the Spatial Dataset Service configuration. 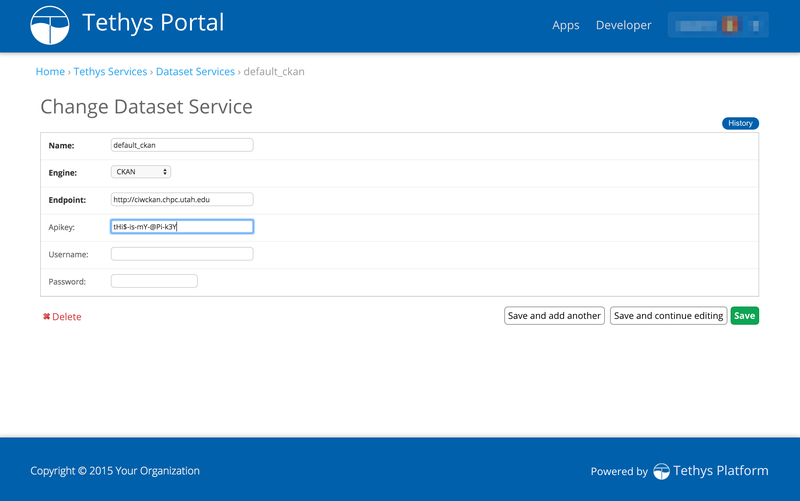 Select "Dataset Services" from the options listed on the Tethys Portal Admin Console. 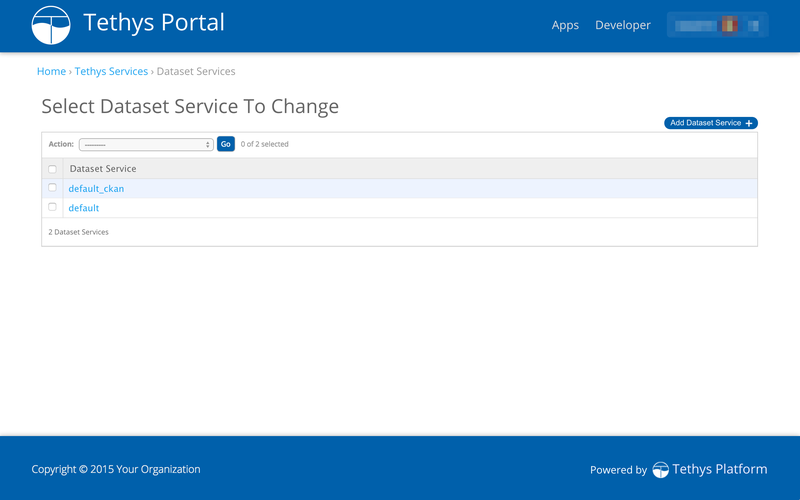 Click on the "Add Dataset Service" button to create a new link to the dataset service. Provide a unique name for the dataset service. When linking Tethys to a CKAN dataset service, an API Key is required. All user accounts are issued an API key. To access the API Key log into the CKAN site where you have an account and browse to your user profiles. The API key will be listed as a private attribute of your user profile. Press "Save" to save the Dataset Service configuration. 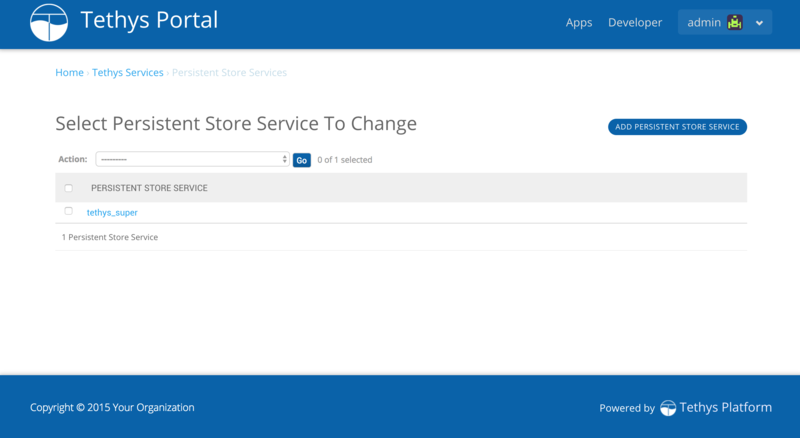 Select "Persistent Store Services" from the options listed on the Tethys Portal Admin Console. 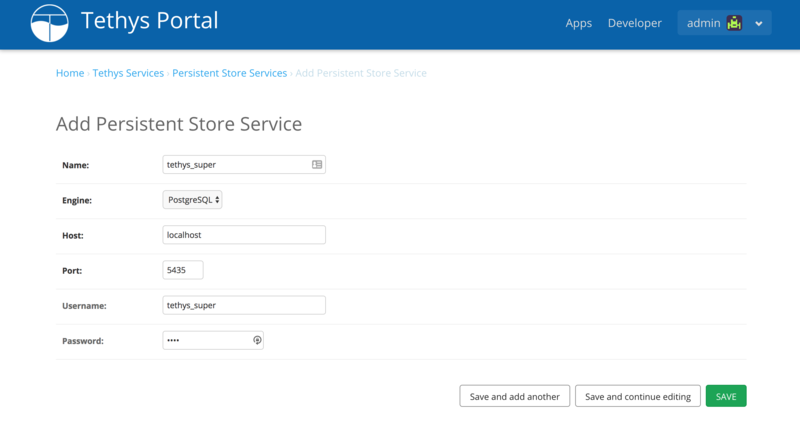 Click on the "Add Persistent Store Service" button to create a new link to the persistent store service. Provide a unique name for the persistent store service. Press "Save" to save the Persistent Store Service configuration. Head over to Getting Started and create your first app. You can also check out the Software Development Kit documentation to familiarize yourself with all the features that are available.